Amazon Prime Has A Monthly Payment Option! You are here: Home / Great Deals / Amazon Deals / Amazon Prime Has A Monthly Payment Option! I have Prime and I love it! Being able to catch one of those great quick deals without having to get to a $49 minimum order AND FREE two day shipping is Fantastic! But it’s tough shelling out $99, especially when you aren’t sure you are going to use it all year. But, did you know there is a Month to Month option?! 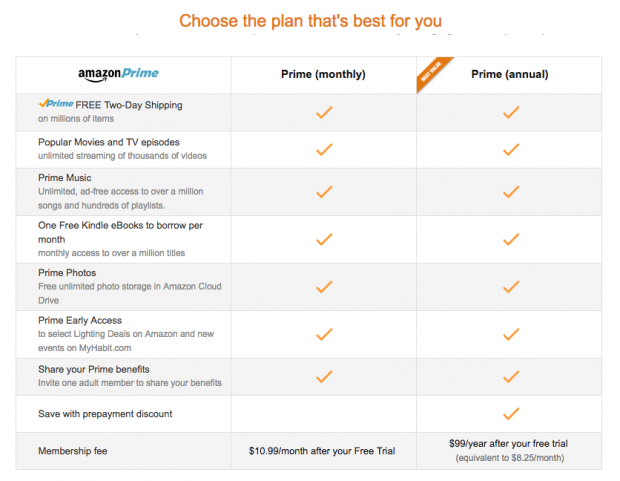 When you start off with a 30 day FREE trial to Amazon Prime, you now have the chance to follow up with a Monthly plan at $10.99 per month instead of the full Year of Membership for $99! Of course the full year option is your best price over all, but if you only use it 3 months of the year, then the monthly option is a better choice for you!